Dr. Lindsay Peters is a recent graduate of Stony Brook University’s Doctorate of Physical Therapy Program. She attended Stony Brook University for her undergraduate studies as well, graduating with a B.S. in Health Science and a minor in Disabilities. She was also a division one athlete for the university’s women’s swim team. During her graduate studies in physical therapy, Dr. Lindsay developed an interest in orthopedic rehabilitation and wishes to receive her certificate in this specialty in the near future. Dr. Lindsay’s desire to become a physical therapist began in high school after a swimming injury required therapy. 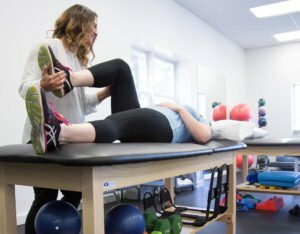 This allowed her to witness first hand the success and rehabilitation physical therapy can provide. After participating in physical therapy as a patient, she then volunteered at a variety of outpatient orthopedic clinics and hospital settings. Her most memorable experience was at Stony Brook University, where she volunteered for a program called Adaptive Aquatics. In the Adaptive Aquatics program she worked with children with physical and cognitive disabilities for over four years. After seeing the improvement in their quality of life, she knew she wanted to bring that excellence of patient care to all ages. During her free time, Dr. Lindsay enjoys an active lifestyle by working out at the gym, participating in spin class, traveling, going to the beach and spending time with her family and friends. She is excited to begin her career here at Monmouth Pain and Rehabilitation and she believes their passion for wellness and focus on 5 star service is truly like no other.